A good number of people are turning to entrepreneurship rather than going crazy for a comfortable 9 to 5 job. Most people enter online business with a strong desire for quick success. They use WordPress CMS to create a solid online presence with limited financial investments. Choosing a good theme helps you to make your website clean, organized and functional and impress visitors easily and effortlessly. So, we have researched and listed 12 Best WordPress Themes for Business Startups in 2019. Let’s see those themes yourself. This theme is suitable for creating all types of business websites. With its ready-made design concepts, you can easily create WordPress websites without seeking assistance from a programmer. The theme has 12 variants of the main page for such applications: event, fitness room, spa, business, construction, architecture, portfolio, restaurant, car repair, etc. Its installation is very simple. You get several dozens of cool images. You can use them to create demo websites and impress your clients. The layout of this theme is responsive and SEO-optimized, which helps you a lot in search engine optimization. It is a good theme for IT companies as it includes a whole set of ready-made pages. Using the Elementor page builder with the support of the Drag & Drop interface, you can easily create amazing websites. Using its ready-made design concepts will expedite the website development process up to a great extent. As the theme is created with a “Mobile First” approach, you can easily make your website responsive to all mobile devices. Sydney is an excellent choice for freelancers, agencies and companies looking for a business-focused and conveniently customized theme. It comes with a number of features, such as a Full-screen slider, fixed navigation, etc. All these features and settings will help you to make your website look professional. It also provides you with the access to all Google fonts and full control over layout and colour options. It gives you many options to create amazing designers that fit your business brand perfectly. Compatibility with mobile devices, integration of social networking icons and translation facility increases the usability of this theme up to a great extent. Striker is a good theme for all those site owners and bloggers who are looking for a good start. It offers a clear design that you can use as a finished product or customize it as per your specific needs. You can add the color scheme of your brand and add content to specific areas of your website while using this theme. The embedded slider makes your web pages look stunning. The flexibility of this theme makes your website look great on all devices. It is a perfect theme for startup companies or individuals who provide the WordPress Theme Development Services to clients. If you are looking for a free theme with premium features, including custom widgets, a drag-and-drop page builder, and a built-in portfolio creation engine, your search ends with this theme. This theme offers several ready-made demos that you can easily install on your site with the help of Demo Importer ThemeGrill. It also offers the necessary tool to create WordPress websites easily and effortlessly. Design elegance is of great significance while creating professional websites. Using this theme, you can easily create exquisite websites with contemporary trends and minimalism. It comes with several features, such as a full-screen image on the main page and the ability to connect many popular plugins. Its premium features allow you to create highly functional websites with minimal time and money. Both beginners and experienced WordPress users greatly appreciate the simplicity and convenience of customization offered by this theme. Using this theme, you can easily create all types of websites with necessary features and functionalities. It comes with several features among which its integration with Schema micro data is the most important one as it helps in quick indexing of web-pages and a sharp increase in the SEO ranking of your site in the SERPs of all leading search engines. As suggested by its name, this theme gets customized easily and quickly. So, both beginners and professionals use it extensively to offer WordPress Website Customization Services to clients. Using this theme, you can create beautiful and mobile-friendly websites. Based on your specific needs, you can embed premium functionality in your website, including advertisements (icon and descriptive text) and social networking icons and integrate the theme with popular plugins such as WooCommerce. Optimizer allows you to create all types of WordPress websites without having any experience coding and site-building. It is a ready-to-use theme which is Based on HTML5 and CSS3 technologies. It is SEO-oriented and suitable for mobile platforms also. You can use the online editor to customize your site fully and improve its look. Just make use of a slider and different settings of this theme to create beautiful landing pages for websites. It is a good WordPress theme for creating E-commerce websites with a beautiful and elegant design. It has a full-screen slider on the main page and provides a smooth scrolling, which makes navigation more enjoyable and enjoyable, helping you to boost the user engagement with your brand by leaps and bounds. It has animation support. Your store looks stylish and trendy. It has a responsive design, social buttons and multi-language support, that are essential to get the desired success in the E-commerce world. This is perhaps the best theme if you to create WordPress websites for magazines, newspapers and publishing sites. It has an elegant and beautiful look, with colorful buttons, an excellent slider and an intuitive content structure. Useful features, such as WooCommerce compatibility, 15+ widgets and 5+ custom widgets, 6 social buttons, 1 user menu, responsive design, multi-language support, Social buttons, Widgets, etc, increase the usability of this theme up to a great extent. 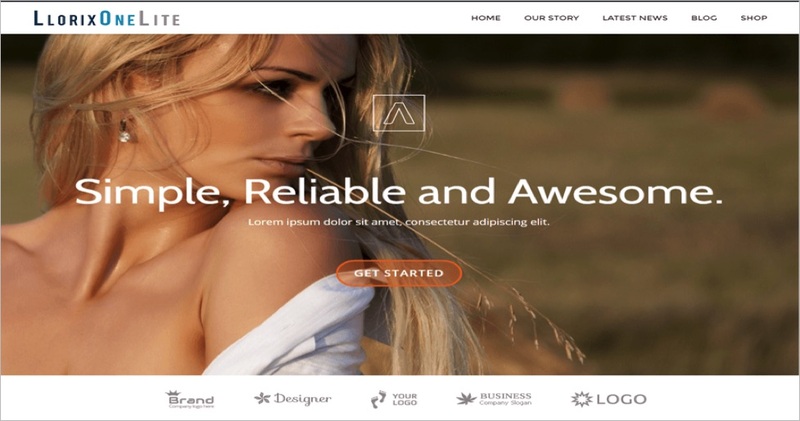 Amax is one of the best WordPress themes that can be used to create all types of websites. Its modern design appeal to visitors. With this multipurpose theme, you get very flexible tools. So, you can change the font and color of the page palette, choose from several website headers and layouts as per your wishes. This theme helps you to create amazing websites that stand out of the world. It is fully responsive and works well on all devices. Startup companies can easily beat the huge competition in the online business and be a leader in the market with a well-designed website. Choose from these themes if you want to create professional and amazing websites easily with absolute perfection. Marie Thomas is a professional Wordpress developer who are great at delivering focus in her writings. She currently works as a senior writer for Wordsuccor. Wordsuccor is a Custom WordPress Theme Development company, giving proficient theme & templates customization services across the globe. Really informative blog of WordPress Themes for Business Startups. Thank you Marie for sharing this information.